A new type of connected system that replaces your router for seamless Wi-Fi coverage throughout your home, helping eliminate dead zones and buffering. Network Assist technology keeps your connection fast by always selecting the clearest channel and fastest band for your devices. A simple app gets you set up quickly and allows you to see what's connected, prioritize devices, and pause the Wi-Fi on kids' devices. A single Wi-Fi point covers up to 1,500 sq. ft., a set of three covers homes up to 4,500 sq. ft. Wi-Fi points work together so you can add more if you need additional coverage. A new type of connected system that replaces your router for seamless Wi-Fi coverage throughout your home, helping eliminate dead zones and buffering. Network Assist technology keeps your connection fast by always selecting the clearest channel and fastest band for your devices. A simple app gets you set up quickly and allows you to see what's connected, prioritize devices, and pause the Wi-Fi on kids' devices. A single Wi-Fi point covers up to 1,500 sq. ft., a set of three covers homes up to 4,500 sq. ft. Wi-Fi points work together so you can add more if you need additional coverage. Attic to basement connectivity Enjoy a fast signal in every room, on every device thanks to a new type of connected system. Keeps itself fast with Network Assist Advanced software works in the background to manage your network so you never have to. Network Assist always selects the clearest channel and fastest band for your devices. A simple way to control what matters Through the companion app, it’s easy to share your password with guests, prioritize devices on your network, see what’s connected, and more. 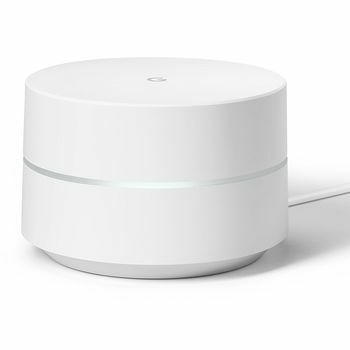 Family Wi-Fi controls Google Wifi allows you to pause the Wi-Fi on kids’ devices, like during bedtime or dinnertime. How many Google Wifi points do you need? One: Small home or apartment 500-1500 square feet. Two: Medium home 1500-3000 square feet. Three: Large home 3000-4500 square feet.